Today you get two book reviews in one – My Life in France by Julia Child with Alex Prud’Homme, and Julie and Julia: My Year of Cooking Dangerously by Julie Powell. I actually bought my copy of My Life in France way back in March when I picked it up in a clearance sale, but hadn’t gotten around to reading it. I recently picked up one of the (heavily discounted because it’s on the bestseller list) Julie and Julia books. And then I found out that I won a draw for a preview movie ticket, so I figured that I should probably read both books before going to enjoy the movie. I first started reading Julie and Julia. It was a relatively quick read and I can certainly see how it would appeal to a certain kind of reader. My best description of the book would be to say it’s like Bridget Jones or one of the Shopaholic books, but with a lot of swearing, some food, and less charm. I tried to like this book – I really did. But I have to admit that she got on my nerves. It’s not so much about the food as a journey that Powell takes to “find herself.” Julia Child and her food just happened to be the tool. To be very frank, there were too many times that I felt like she didn’t like any of the food she was making. And when she did like the food, the descriptions usually ended up being something like “hmm” or “mmm” or “it was good so we ate it” (I’m paraphrasing). There weren’t really many explanations as to why the food tasted good to her, or even in most cases why the food tasted bad. Half-way through Julie and Julia I HAD to take a break. And so I switched to My Life in France. This book is not so much an autobiography but is actually a collection of memories and vignettes, accompanied by many fantastic photos taken by Paul, Julia’s husband. I found this book even easier to read than Powell’s book due to the length of each vignette. Similar to a book of short stories, it is a book that can be easily picked up and put down again without interuppting the narrative flow. Julia and Paul’s adventures in France made for entertaining reading. And, unlike Powell’s book, you can actually feel the passion Child had for food. Food, however, isn’t the only thing that you experience in this book. You get to see post-war France through Child’s eyes, and even some insight into the political life of the U.S. diplomatic service. This book makes me want to go to France. And to try cooking some of Child’s recipes, whereas Powell’s book gave me very little encouragement to even flip through the cookbooks. If you want to learn about Julia Child, I highly recommend My Life in France. I unfortunately cannot say the same for Julie and Julia, unless you’re looking for chick lit. I’m seeing the movie tonight, so expect a review in the next couple of days. Edited to add: After some thought over the past couple of days I decided that I should have added this to my original review. I just wanted to say that my opinion of Julie Powell’s writing is only based on her book, and not the old blog or her current blog. I’ll be honest and say that I don’t read either one. At one point I did read a bunch of her Julie/Julia blog posts around the time that she was finishing her project but I didn’t find it particularly compelling at the time and never bothered to read the whole thing or to continue to follow her. 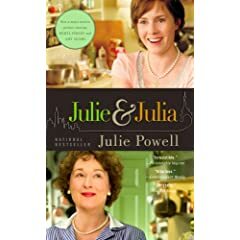 I do admire that she finished the whole project, but I didn’t care for the book and I think I agree with Julia Child’s opinion that it didn’t seem like Julie respected the food.